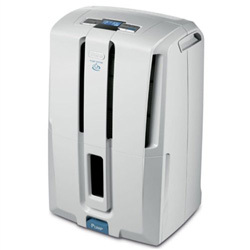 The DeLonghi DD45 Dehumidifier is an energy efficient room dehumidifier with Energy Star certification. This unit is suitable for smaller areas of the home not exceeding 700 sq ft (manufacturer's recommendation) and has a maximum water extraction rate of 45 pints per day. Unlike the DeLonghi DD45P this unit does not have an internal condensate pump. It also lacks an auto-defrost function so is not suitable for low temperature operation. The lack of these refinements is compensated for by a lower purchase price for those who do not need them. Please be aware that the lack of auto-defrost means that this dehumidifier is not suitable for a basement or other cool area. The DeLonghi DD45 Dehumidifier is pleasingly styled and aimed squarely at the user who wants a dehumidifier for use in a living room, bedroom or other area of the home. It is portable in order that it can be moved from room to room as required, made easier by the provision of caster wheels and two carrying handles on the upper sides of the unit. This dehumidifier is a little heavy for a unit in its class. Users describe it as solid and well made which may be a reassuring explanation for its greater than average weight. Although lacking an internal condensate pump the DeLonghi DD45 Dehumidifier is still capable of continuous drainage to a nearby drain at floor level using a gravity drain feed. In some instances it may be advisable to raise the unit a foot or two above floor level to make most effective use of this facility. For many users emptying the water collection container could be the most convenient way to discharge the water. Users report favourably on the easy to use electronic controls and the LCD digital display is also appreciated. Another welcome feature, not found in all dehumidifiers in this class is a 24hr programmable timer which allows the user to pre-set times when the device will turn on and off. The DD45 also features an advanced air filtration system incorporating a filter which is washable and can be replaced as required. On occasions when dehumidification is not required the unit can be run with only the fan operating for better circulation of air. Unlike the DD45P this unit has three fan speeds allowing the user to determine whether the unit should work faster to reduce humidity, at the cost of a higher noise level, or more slowly with the benefit of quieter operation. The most important feature of the DeLonghi DD45 Dehumidifier is its adjustable humidistat. This device enables the user to pre-set the level of relative humidity required and the unit simply cycles on and off to maintain the chosen level. This is an additional energy saver and makes operation of the unit largely automatic. A level of relative humidity of 50% or slightly lower will suit most circumstances, being comfortable and sufficient to prevent mold growth and other moisture damage as well as deterring dust mites which prefer damper environments. Levels below 40% are not recommended in areas with items containing wood or leather as excessive drying may damage these materials.